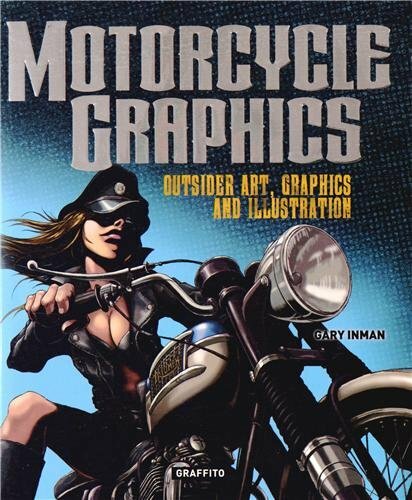 Motorcycle Graphics is an enjoyable and riotous collection of contemporary bike art put to put together by journalist Gary Inman who's also a biker himself, of course. It's a 256-page hardcover with the illustrations printed on good paper. The 30 contributing artists are from different countries. Most ride, some don't, but all have a special interest in motorcycles. There's a good variety of artworks befitting the numerous clans, tribalism and sub cultures. The art is great, created from all sort of medium, acrylic, sketches, digital paintings or even vector art. There's a lot of styles to look at, and you can marvel at the different ways each artist draws their bike. This book should appeal to bikers, biking artists or artists who want to check out different artistic styles. Here's the list of artists included.